Double the firepower. Double the class. 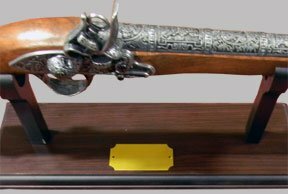 This double-barrel, non-firing flintlock reproduction just oozes with power and sophistication. Leave it to Napoleon to make killing look so good. 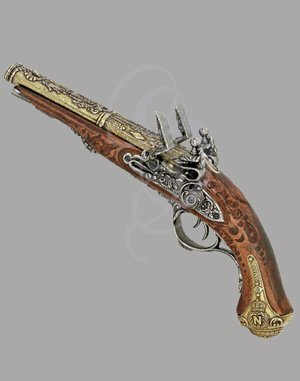 This flintlock is a reproduction of a Napoleon pistol. The original was capable of firing double projectiles before having to reload. Quite important since the average loading time for a flintlock pistol was 3.5 hours (okay, maybe not that long). This reproduction has fully functional locks (for those of you hung over, that means that stuff actually happens when you pull the trigger). The stock itself is a polished hardwood stock with antique finished zinc cast metal fittings and barrel. This item is a gorgeous collection piece and a fabulous addition to any costume. Particularly good for elegant pirates or other classy but dangerous) gunmen.